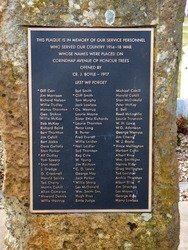 A monument lists the names of the soldiers for whom a tree was planted for in the Avenue of Honour. 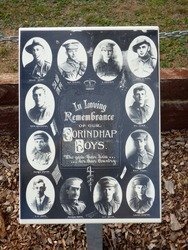 At a meeting of the residents of Corindhap it was decided to plant an Avenue of Honor in memory of the boys, on the main Rokewood to Ballarat road. Subscription lists were opened towards the above, and £10 was handed in at the meeting. Tree planting is to take place on Saturday, 15th inst. to be followed by a social evening in the Mechanics' Hall. Messrs R. Vick and Geo. Laidler were appointed secretaries. Berringa Herald (Vic), 8 September 1917.